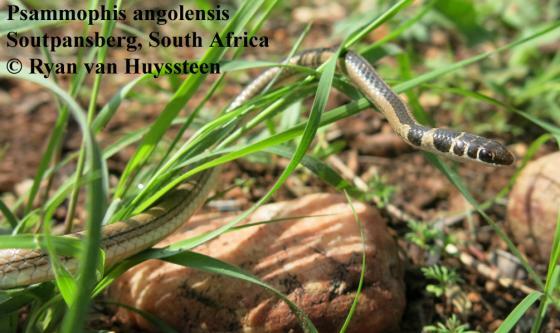 Can you confirm these amateur observations of Psammophis angolensis? Distribution Zimbabwe, N Botswana, NE Republic of South Africa, S/C Mozambique, NE Namibia, S Democratic Republic of the Congo (Zaire), Tanzania, Zambia, Angola, Malawi, Ethiopia (relict population); elevation 0-1500 m.
Diagnosis Description (155 specimens examined): Nostril pierced between 2 nasals; preocular 1, usually widely separated from frontal; postoculars 2; temporals usually1+2; supralabials 8 (rarely 6, 7 or 9), the fourth & fifth (rarely third & fourth, fourth only or fifth & sixth) entering orbit; infralabials 8 (rarely 7 or 9), the first 4 (rarely or 5) in contact with anterior sublinguals; dorsal scales in 11-11-11 rows (9 in NMZB 1075 only); ventrals 1-157; cloacal shield divided; subcaudals 58-80. 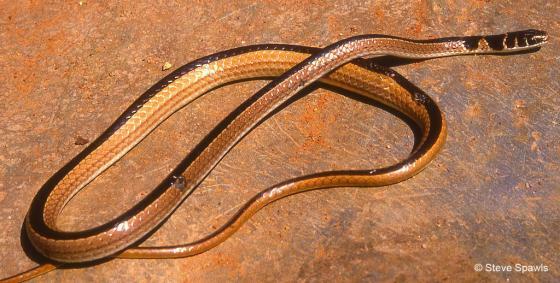 Head dark brown, three narrow yellow transverse bands posteriorly, supralabials white; neck dark brown with one or two grey crossbands which broaden laterally, a dark brown black-edged dorsal band three scales wide, greyish or yellowish laterally, sometimes with black hairlines through the outer two scale rows. 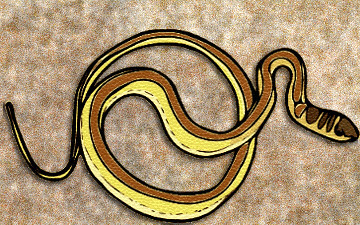 Ventrum and lower half of outer scale row white or yellow, uniform or with an ill defined lateral series of dark flecks, sometimes a midventral pale orange band present [from BROADLEY 2002]. Comment Habitat: Widespread in savannas from sea level to 1500 m.
Etymology Named after its distribution in Angola.